Saying “farewell” to the winter…. it’s Winterend! Time to start rolling out the clips, let's kick it off with the teachers' introduction! Szalone Dni Muzyki 2017 during “La Folle Journée” Festival with a big band! Two years ago we participated in Fallin in Blues as students and this year we did it as teachers. It was really nice to visit the city again and have blues classes – this time from the other side 🙂 Thank you very much and we hope to see you again in the nearby future! by the way, what is Slow Dance? People often ask us how they should understand the term “Slow Dance” and what is the difference between Slow Dance and other dances? That is a good question! The easiest and the best definition of Slow Dance is just dancing to slow music. But practice isn’t as easy as the theory 🙂 Dancing to very slow and very fast music are the two main challenges of swing dancers, which is why it is worth practicing, even if the goal is reaching a contrast in your regular dance, making your dance more interesting and conscious. – entering a frame (closer embrace) from time to time, pivots, etc. – elements borrowed from other styles, such as Blues, West Coast Swing, Tango, etc. Dancing to slow swing music can have a very wide scope, depending on the character of the music. The groove can be more rhythmic or melodic, have a more swinging feeling or focus on a single beat and the beat itself may be sharp or smashy. If the swinging mode prevails, the dancers need to slowly fill in all the time and space between the beats, making their movement very smooth. This requires mastering the technique of a gradual shift of your balance and is related to advanced work of your feet, as well as gradual body movement (in contrast to the sudden changes of balance). The dance has a sway and a bit of Fred Astaire and Ginger Rogers flavor to it, even though it typically also maintains the tripples, swing-out and other Lindy Hop steps, rhythms and figures. As you can see, there is a wide variety of styles in Slow Dance and everyone can choose something for him- or herself. 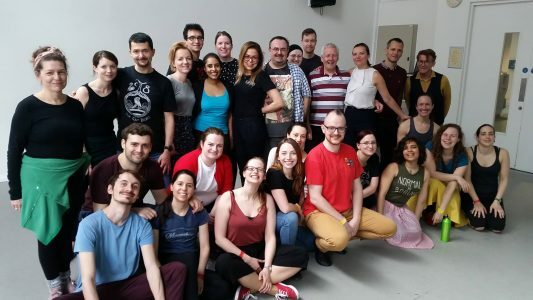 It is useful to take at least one Slow Dance workshop in order to try a different approach to swing dancing and decide for yourself, what you could adapt to your Lindy Hop or Blues. 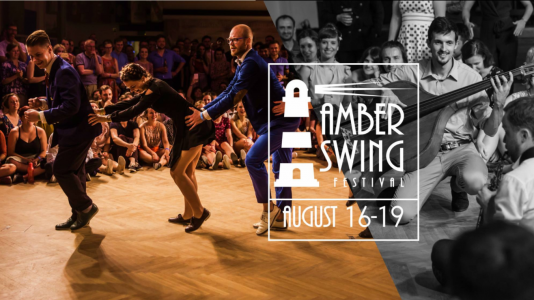 Amber Swing – here we come! It is our first time to teach Slow Dance classes on a Lindy Festival. We are really excited and looking forward to present a different style than people are used to. During our holidays we finally had some time to do a recap on Slow Dance classes which we have had on Valentine’s Blues. During the classes we focused on “walking” type of slow dance and covered basics of movement, stretch and connection – all based on several figures. More than 700 pubs in one city? yes, only on Fair City Blues! Dear Dancers and Friends from all over Europe, we would like to wholeheartedly thank you for being given the opportunity of spending this beautiful weekend with you! We want to thank Olga, Audrey and Margarita for inviting us and taking such good care of us and all the hard work involved in the event organization. We’d like to thank the students for participating in our classes as well as great moments on the dancefloor (you rock!) and the musicians for inspiring us to dance. We would like to wish a very bluesy Christmas to all of our students and fellow dancers all around the world. We feel very thankful for all the great moments and dances we had with you this year. May all your dreams come true in 2018!